A long wharf connected the dockyard to the main warehouse, which was located on a plinth some 3.5 meters above the ground. The first concern of the Harappan engineers might have been to ensure against floods and tides (which may have been their undoing at Mohenjo-daro and Harappa). The whole town was situated on a patch of high ground. Rising from the flat alluvial plains of Bhal a wall was erected to encircle the town, and a platform was built where goods were checked and stored. The warehouse was divided into 64 rooms of around 3.5 square meters each, connected by 1.2 meter wide passages. Twelve of these cubical blocks are visible today. Seals were used to label imports and exports passing through the dock. Some of these labels or tags have been found during excavations. 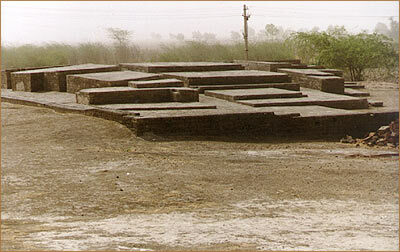 Kiln fired bricks, which the Harappans had learned were unaffected by tidal waters, were used in making the passages to protect the cargo.